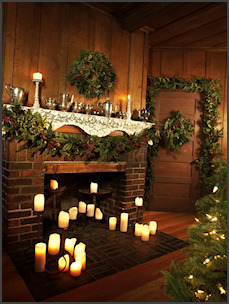 Author: Karen Jebbia; Christmas wreaths have a seasonal connection with the pagan feasts of the winter solstice. Winter solstice happens on the shortest day of the year when, in the northern hemisphere, the earth is tilted farthest away from the sun. The sun has its lowest arc in the sky of the year on winter solstice. 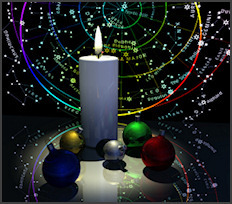 Winter solstice ceremonies were performed by many cultures over time. Fear that the sun would never return were the motivation for these ceremonies. Ceremonies and celebrations gave hope. Many of these cultures were pagan sun worshipers. Some of the greatest architectures of ancient cultures were built to align with the solstices and equinoxes  temples, tombs, cairns and sacred observatories. The earliest Christmas wreaths were made from holly during Roman times. Holly was looked on as having magical powers to the ancient Celts as it was one of the few plants to survive and look beautiful in the winter. The Celts picked holly boughs and put them in their houses to ward off the evils they believed lurked about in the darker months. Roman soldiers are believed to have brought the idea of decorating with holly back from Britain. Holly was used by the Romans during their winter solstice celebrations and became sacred to Saturn, the sun god the Romans worshipped. The week long winter solstice celebrations of the Romans honored Saturn. Holly wreaths with their bright red berries were given as gifts. Holly was everywhere during these celebrations  on the public buildings, in the streets and shops, inside and outside of homes. The tradition of giving wreaths as gifts started here. Holly was thought to be lucky so the more you had the better off you were. Early Christians in Rome would decorate their homes with holly to avoid persecution during the winter solstice festivals even though they didn't worship Saturn. Over time the meaning behind the tradition of holly Christmas wreaths blurred and it eventually became a symbol of Christian faith. It was used to explain the life and death of Christ. The leaves represented the crown of thorns and the red berries represented Jesus' blood. The Roman Emperor Constantine gave official status to Christianity and forced all the pagans to be baptized into the Roman church. He needed to join the Christians and pagans and so pagan rituals and idols took on Christian names and pagan holidays like winter solstice festival became Christian holidays. December 25th was the birthday of the Gods to the pagans. Eventually many pagan symbols and traditions were melded into Christian symbols and traditions. Today Christmas wreaths are a seasonal tradition that most people in the United States follow. You don't go by many houses without a wreath on the door during the holidays. 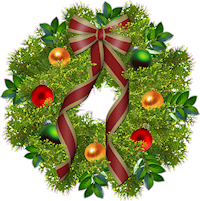 The meaning of the wreath is not so much about religion as it is about showing seasonal cheer and good will to all. A Beautiful Video on the Winter Solstice and Yule Log Traditions. More on the Winter Solstice. "At the Winter Solstice, we celebrate Children's Day to honour our children and to bring warmth, light and cheerfulness into the dark time of the year. Holidays such as this have their origin as "holy days". They are the way human beings mark the sacred times in the yearly cycle of life. The solstice itself may have been a special moment of the annual cycle of the year even during neolithic times. Astronomical events, which during ancient times controlled the mating of animals, sowing of crops and metering of winter reserves between harvests, show how various cultural mythologies and traditions have arisen. This is attested by physical remains in the layouts of late Neolithic and Bronze Age archaeological sites such as Stonehenge in Britain and Newgrange in Ireland. The primary axes of both of these monuments seem to have been carefully aligned on a sight-line pointing to the winter solstice sunrise (Newgrange) and the winter solstice sunset (Stonehenge). Significant in respect of Stonehenge is the fact that the Great Trilithon was erected outwards from the centre of the monument, i.e., its smooth flat face was turned towards the midwinter Sun. The winter solstice may have been immensely important because communities were not certain of living through the winter, and had to be prepared during the previous nine months. Starvation was common in winter between January and April, also known as "the famine months". In temperate climates, the midwinter festival was the last feast celebration, before deep winter began. Most cattle were slaughtered so they would not have to be fed during the winter, so it was almost the only time of year when a supply of fresh meat was available. The majority of wine and beer made during the year was finally fermented and ready for drinking at this time. The concentration of the observances were not always on the day commencing at midnight or at dawn, but the beginning of the pre-Romanized day, which falls on the previous eve.